I had a similar problem and I had to use http://www.intensedebate.com as the domain instead of http://intensedebate.com that fixed it for me. Thanks for letting us know. We'll get this fixed! Thanks Bwana, we really appreciate your kind words! The features we implement are done with you in mind. We're lucky to have your feedback – we've basically got user-based focus groups. It doesn't get better or easier than that to determine which features to build. So keep it coming…(yeah I know, seesmic integration…trust me I'm lobbying for you). I too am proud to call myself an IntenseDebate user. James, were you able to correct this by entering the www. as skabber recommended. That worked for me. Let me know because I'm chatting with fellas at FriendFeed right now. It worked now, with www. Thanks!!! Guys, I'm beyond impressed with your progress. I commend you on a great blog commenting system and also for keeping the community in mind when you implement new features. I'm proud to call myself an Intense Debate user. 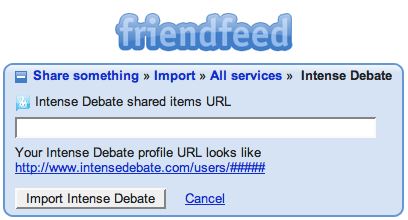 Sign in to Friendfeed… but when importing my Intense Debate ID I receive a message "We could not find the given account". I think it's a FriendFeed bug, better talk to them! I installed it on my blog, but facebook connect doesn't work! Can someone help me to understand why. I have followed all the instruciotns, but I alway get a "page not found" on the popup afterfilling in username and password for log in!